A week-long diving safari starting and ending in Sharm El Sheikh. Visit the best that the Northern Red Sea has to offer. Magnificent drift, reef, wreck and wall diving, caves, plateaus and the big blue. Dive into an underwater world that is unique in both variety and the sheer number of species. 1. Day Afternoon/Evening: transfer to New Marina (El Wataneya) port and embark. Welcome on board, cabin arrangement and boat–briefing. Permission work with port authority, sailing very early next morning. 2. - 7. Day Morning: sail to nearby Temple or Ras Katy for a check dive. The week long safari will cover the area from the Strait of Tiran, Ras Mohamed National Park and the Gulf of Suez which is usual visited first. The National Park begins at the small bay of Marsa Ghazlani followed by the larger and deeper bay of Marsa Bareika. Continuing along the coast to Ras Za’atar, Jackfish Alley, Eel Garden and Shark Observatory, to the southern end of the peninsula with Anemone City, Shark Reef and Yolanda Reef and ending at the Quay. Because of the geographic position this is a privileged area distinguished to strong massive currents that transport large quantities of plankton and other food that give rise to an extraordinary growth of stony and soft corals and attract large schools of both reef and pelagic marine fauna, over a thousand species in all. Schooling barracuda, jackfish, tuna and many kind of sharks swim in these deep blue waters, especially in summer from June to August, sometimes early September. The safari will also take you to famous sites like the wrecks of Dunraven and Thistlegorm, Shag Rock and the wreck of Kingston, sail to Sha’ab Ali where pods of dolphins are common, explore several spots at Sha’ab Mahmouds reef system. Don’t miss the four famous reefs in the Strait of Tiran: Jackson, Thomas, Woodhouse and Gordon Reef, probably the most interesting and richest in marine life. You can choose from several dive sites with superb wall and drift diving. In the afternoon of the 7th day the boat will return to Sharm area. 7/8. Day: Depending on your check out and flight time return to New Marina (El Wataneya) port and disembark. Transfer to airport or hotel. You need to be at least a PADI Open Water certified diver or equivalent and have 15 logged dives. PADI Advanced Open Water diver or equivalent is needed for wreck penetration dives and some of the more experienced dive sites visited on this safari, Thistlegorm requires at least 20 logged dives. 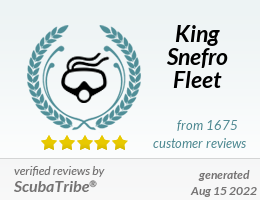 You must have dived in the last year and recorded this in your log book to join this safari; if needed Scuba Review is available onboard. PADI OWD´s are able to join the night dives if they have previous night dives logged. This trip is suitable for snorkelers to join. The itinerary is an example so if you have a special wish for a certain place in this area just let your dive guide know. Liveaboard itineraries are subject to various unpredictable changes including weather conditions. All dives and especially some wreck dives are subject to divers experience and weather permitted. Liveaboard itineraries depend on Egyptian Government, Coast Guard and/or Marine Police approval. Every effort is made but we cannot guarantee diving at specific sites. The final decision lies with the captain and guide. Safety comes always first!